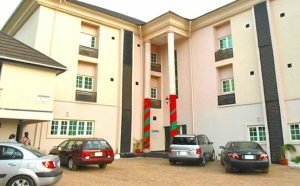 House 9 Apartment, Abuja ranks among the high profile groups of hotels in Abuja. 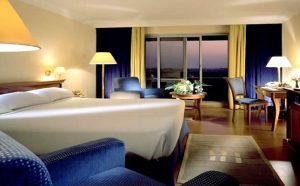 It is one of the best hotels in Abuja when it comes to excellent customer services. Located at the heart of Abuja, the hotel is centrally located for easier access to major tourist attractions and places of interest such as Nnamdi Azikwe International Airport, National Stadium, National Assembly Complex and Federal Secretariat among other places. House 9 Apartment is a newly built hotel off the noisy and busy axis of Maitama area in Abuja, providing very affordable, comfortable and private environment for your relaxation. The hotel offers 40 tastefully designed and well equipped apartments in studio and one bedroom set up and furnished to the best of standard. Also available is a standard laundry, a well equipped kitchen and lounge. Enjoy up to a whopping 51% discount on your next visit as a generous reward for spending one splendid night in the air conditioned tastefully furnished executive rooms. 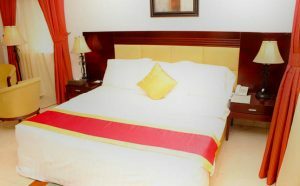 Standard Room features a big double bed that can comfortably sleep two guests. 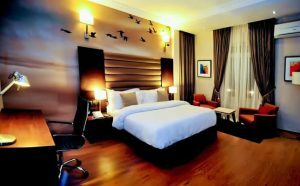 The room is also equipped with wardrobe, reading spot lights, flat screen TV with cable channels. Other facilities include air conditioning system, internet access, refrigerator, in-room telephone, bathtub and shower. Occupancy: 2 | Rates From: ₦10,000. Classic Room features air conditioning system, a king size bed and an en-suite shower. The room can comfortably accommodate two adult guests. Other room facilities include wardrobe, reading spot lights, flat screen TV with cable channels. access, refrigerator, in-room telephone, bathtub and shower are also available. Occupancy: 2 | Rates From: ₦15,000. The hotel’s Suite is designed to offer total relaxation. The rooms are spacious and tastefully furnished to make you feel at home, and it can comfortably accommodate two adult guests. Room features include air conditioning system, a king size bed and an en-suite shower. Other facilities are wardrobe, reading spot lights, flat screen TV with cable channels. Internet access, refrigerator, in-room telephone, bathtub and shower are also available. 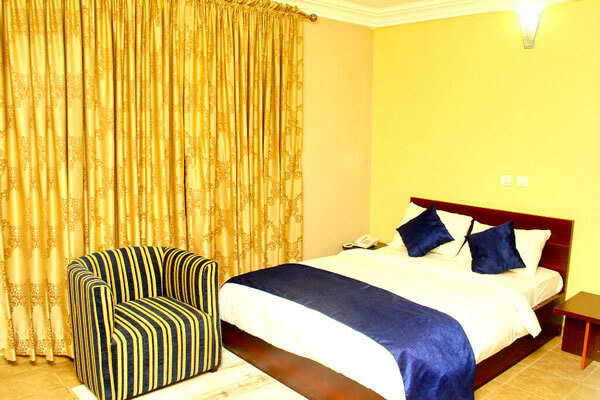 Occupancy: 2 | Rates From: ₦25,000.